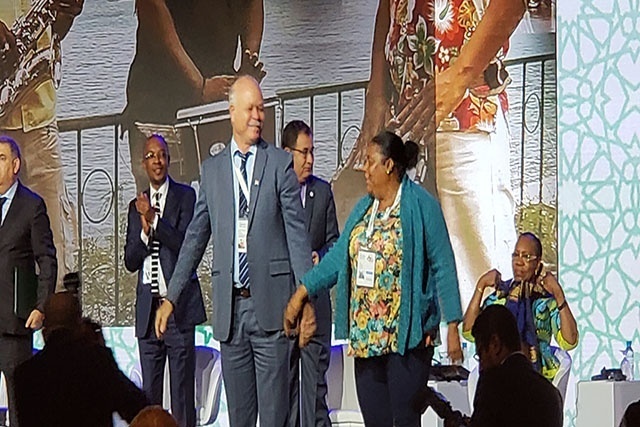 (Seychelles News Agency) - A Seychellois author and songwriter -- David Andre -- has produced the anthem for the United Cities and Local United Cities and Local Governments of Africa. The anthem was presented on Tuesday at the opening of the 8th Africities summit taking place in Marrakesh, Morocco from November 20 to 24. Andre, who is the Mayor of Victoria and a member of the executive committee of the organisation, was entrusted with the task of composing an anthem in a meeting with the Secretary-General, Jean-Pierre Elong-Mbassi. "I already had an instrumental track on my Métissage album and from that idea, I composed the anthem of the UCLGA representing Africa," Andre told SNA. The anthem of the UCLGA is in English but includes parts in French, Swahili and Arabic. Andre had hoped to get the participation of other African artists in the anthem for the opening but could not for logistics reason. He hopes it will be done in the future. For this version of the anthem, Andre was accompanied by local female singer Jany de Letourdie. "I enjoyed the idea of participating in this song, and when David made me listen to the intro, I totally embraced it and felt carried away by Africa," de Letourdie told SNA. Africities is the United Cities and Local Governments of Africa’s flagship held every three years in one of the five regions of Africa. It brings together more than 5,000 actors from the African cities and aims at addressing major questions based on the construction of the 2063 Vision of Africa with debate proposed by the African Union Commission. David Andre would like everyone in Africa to be inspired by his song to make a positive contribution to society.